There is mention of the Ahhiyawa kingdom and people in the Hittite records, and for a time the two people had a close relationship. It is not known where the Ahhiyawa kingdom was originally located - it has been suggested that the Ahhiyawa people could be identified with the Archaeans (Mycenaean Greeks) and therefore the land of Ahhiyawa could be the kingdom of Mycenae., equally it has also been argued that Ahhiyawa could have been one of the islands of Crete, Rhodes or Cyprus. A group of peoples who were part of the Sea-Peoples collation who along with Libya attacked Egypt in Year 5 of Merneptah's reign. Although as there is no mention of the Akawasha in the wall-reliefs of the battle, they are mentioned in the inscriptions describing how they along with some of the other Sea-Peoples had their hands amputated. Egypt came into conflict with Assyria over the control of states in Syria and Palestine - eventually Egypt was invaded by the Assyrian army and the Nubian pharaoh Taharka was forced to flee back to the south. Worse to come for Egypt, in 664BC the Assyrian king Ashurbanipal returned to again invade Egypt (following the Nubian ruler Taharka again entering Egypt), this time Thebes was sacked - Ashurbanipal returned to Niveh with treasure captured from the once-great capital of Egypt. In 616BC Egypt and Assyria forged an alliance due to a new threat from the Babylionians and Medes. Ancient Egypt has a long record of trading with the Byblos - it was a major port on the Syrian Coast, it was from here that the supplies of cedarwood were relayed to Egypt. Byblos was independent from Egypt but was heavily influenced by Egyptian styles and customs. The Carians were a people that lived in Asia Minor, they were hired as mercenaries by Psammetichus I (along with Greeks and Phoenicians) to fight such people as the Assyrians and Nubians. The Carians were used throughout the 26th Dynasty a policy not always liked by the Egyptian population. From its small origins - first as a state, the Hittites were to build their country into an Empire. They came from the north of Asia Minor (Anatolia), but their Empire grew to such an extant that they came into conflict with many of the other powers in the area - especially Egypt and Assyria. The two pharaohs Seti I and Ramesses II (The Battle of Kadesh) most notably had battles with the Hittites. Egypt and the Hittites were eventually to sign a treaty (each claiming that the other had been forced to sign first), but after this the two countries were to exchange letters, gifts and so on. The Hittite empire was to eventually end when the Assyrians conquered their lands and make them part of their Assyrian empire. The foreign Hyksos kings ruled Egypt during the 2nd Intermediate Period, - the kings of the 16th Dynasty and the Theban Princes of the 17th ruled simultaneously but with a worsening relantionship until civil war broke out. According to ancient Egyptian history, the Hyksos came from an obscure country and invaded Egypt 'without a blow'. Also according to legend once the Hyksos wererulers of Egypt they burnt temples, burnt the cities, they lived at Avaris (a site in the delta - Lower Egypt). Eventually they would be defeated and forced out of Egypt by the founder of the 18th Dynasty - Ahmose I. The ancient historian took the word 'Hyksos' to mean Shepherd King, but modern thinking instead takes 'Hyksos' to mean 'Foreign Kings' taking from the Egyptian word meaning "Rulers of foreign Countries'. 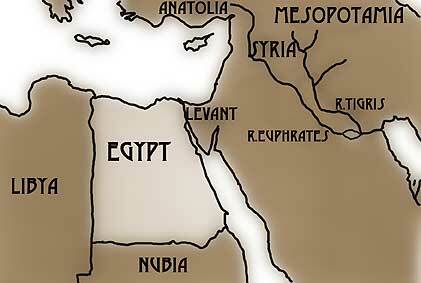 It is thought that the Hyksos people were a group of Palestine Leaders forced into Egypt. The Jewish people have a great link with Egypt. The Bible relates how Joseph was sold into slavery and entered Egypt - he eventually gained status and wealth (by first interpreting the dreams of Pharaoh), the then brought his people (the Tribe of Israel) to settle with him in Egypt. Over the centuries the descendants of these people become part of the slave force forced to work for the Pharaoh before being brought out of Egypt by Moses in the Exodus. Although no direct evidence of any of these events have yet been found in Egypt, objects have been found at Elephantine belonging to a large Jewish community dating from the Persian Period. On the island there was a temple built to Yahweh close to a temple of the Egyptian god Khnum (the Jewish temple was burnt down, but after successfully petitioning the Persian governor, the temple was re-built). Other events in the bible relate to the attack on Jerusalem by a Egyptian King Shishak (identified with Shsoshenq). Tombs dating to the 18th Dynasty in Egypt show foreign people bringing tribute to Egypt - amongst these foreign people is a group referred to as 'Men of Keftiu' from the 'Islands in the Midst of the Sea'. There is plenty of speculation as to who these people were, the location of the island has been suggested to be the Biblical Caphtor / or Crete / or some part of Asia Minor - however, the most favoured answer is that the Keftians were envoys sent from Minoan Crete, and the 'Islands in the Midst of the Sea' were other Aegean Islands at that point also under Crete's control. The phrase 'Libu' first appears in the Ramesside period - it refers to a certain tribe. It was with other Libyan tribes (Tjemhu, Tjehnyu and Meshwesh) who attempted to invade and settle in the Delta (the Sea-Peoples also united with them occasionally). Ramesses II built a line of forts on the western coast to help repel future attacks. But the Libyan tribes returned for a fresh attempt in Year 5 of Merneptah's reign, following this second failure they attempting again in Years 5,8 and 11 in the reign of Ramesses III. In the New Kingdom the term 'Medjay' described a Policeman - the Medjay would patrol and guard the desert frontiers, protect cemeteries and maintained order throughout Egypt. The word 'Medjay' originally dates back to the Old Kingdom, when the word is then used to describe a group of desert tribesmen in Nubia who are recruited into the Egyptian army as scouts and light-armed auxiliaries. Although first mentioned in the time of Amenhotep III, these people did not really enter into Egyptian affairs until the time of Ramesses II, Merneptah and Ramesses III - when they joined forces with the Libyans and attacked Egypt. In Year 11 of Ramesses III's reign the Meshwesh again attacked Egypt, but this time their allies also included the Sea-Peoples. Once more the Meshwesh met with defeat, this time, however, the chief himself was captured. Descendants of prisoners taken during these battles were allowed to settle in Egypt - eventually in 945BC a chief of these 'Egyptian' Meshwesh was to become Pharaoh himself and begin the 22nd Dynasty. During the 18th Dynasty, the Mitanni Kingdom was a major power for Egypt to deal with. Egypt and the Mitanni first met as enemies but soon the relationship changed to being allies. Amenhotep III especially had close ties with the Mitanni kings Shuttarna and Tushratta. Both Mitanni kings sent their daughters to become a wife of Amenhotep III (Ghilukhepa from Shuttarna, Tadukhepa from Tushratta). It is thought that Kiya wife of Akhenaten was also of Mitanni origin. The Mitanni kingdom came to an end when Suppiluliumas launched an Hittite attack upon the kingdom - Tushratta was killed, once he was dead internal and external conflict split the kingdom. One of the Sea Peoples that fought Ramesses III. They have been suggested to have been people who had immigrated into Palestine and became Philistines - the bible suggest their original homeland to be Caphtor which itself may have been Crete or Cilicia. The Egyptian scenes of the battle with the Sea People show the Peleset to be clean-shaven, wear a panelled kilt, a chest protector and a circle of upright reeds or leather strips on their head. From their beginnings as an obscure Iranian tribe, they grew in just over a generation to having the largest Empire in the ancient world to that point. The Persian Empire of the Achaemenid dynasty stretched from central Asia to the Indus, from Egypt to the Mediterranean. The Empire was to last 200 years from the late 6th Century BC until Darius III was defeated by Alexander the Great in 311BC. Alexander the Great's Hellenistic rule did not reach far beyond the cities of the Persian Empire - the Persian culture and religion survived for centuries after, to be continued by descendants of the Achaemenid kings. Originally a term used by the ancient Greeks for the Canaanites - although this term was expanded to include all the people who lived in the coastal area of Syria / Palestine and were of an independent status. The Phoenicians had a great deal of contact with ancient Egypt via the port of Byblos both politically and through trade (this contact dates back to the Old Kingdom). Phoenicians were used as mercenaries by kings of the 26th Dynasty in Egypt - and also helped to modernise the Egyptian navy at that time. It is not known exactly where the land of Punt was actually located, but it was somewhere to the southeast of Egypt - probably on the east coast of Africa near the south end of the Red Sea. The Egyptians make references as early as the 5th Dynasty and expeditions were first made there in the Old Kingdom. Punt was the supply for tree-gum (myrrh or frankincense) which were used in Egyptian temple rituals. The Egyptians obviously regarded the land of Punt as somewhere exotic and mysterious. The reliefs from the temple of Hatshepsut at Deir el-Bahri have many reliefs showing an expedition sent to Punt. Egypt was governed by the Roman senate, as were most other major Roman provinces - instead it became the personal property of Octavian Augustus to govern. Egypt no longer had a king or capital city, was no longer an independent country - it was a district of the Roman Empire, its purpose was to supply grain for the people of Rome. However, Roman emperors still had themselves portrayed as pharaohs - this gave them the ancient right to do what they want with the land and its people (temples in the style of Egyptian pharaohs were also built for the same reason). When Christianity was declared to be the state religion of Roman Empire all temples to the old gods in Egypt were closed. In AD395 the Roman Empire was split into two, Egypt came under control of Byzantium. A name which was used to describe a group of people / tribes who attacked Egypt in the reigns of Merneptah and Ramesses III so that they and their families might settle in the delta. The story of the battles is told on the walls of the temples at Karnak and Medinet Habu (the story also is told in the Great Harris Papyrus). The Sea-People originally attacked the Hittites, Cyprus, coastal cities of Syria - they then travelled down through Palestine and attacked Egypt along with Libyan tribes. Some of the tribes (Peleset and Tjekker) did settle in Palestine, while others did side with the Egyptians, joined the Egyptian army and eventually became landowners in Egypt. One of the many tribes that made up the Sea-People that attacked Egypt in the reign of Merneptah (Year 5) and Ramesses III (Years 8). Egyptian scenes show that the Sheklesh prisoners had their hands removed (and were also circumcised) - these hands were then presented to the King as enemy count (the Sherden, Akawasha and Tursha tribes also received similar treatment). A tribe who fought both with and against the Egyptians. Eventually after entering into military service for Egypt they were to own and cultivate land within Egypt. It is thought that the Sherden people may originally have come from Cyprus, but ultimately settled in Sardinia (an ancient Phoenician inscription found there names the island as Shardan). The Teresh people (also known as the Tursha) fought against Egypt during the reign of Merneptah, these people were part of the Sea-People coalition. Reliefs in Egypt which show the Teresh depict them as being bearded, wear pointed kilts, strips of leather / linen protect their chest and carry either spears or a scimitar. They are thought to have been the Tyrsenoi (ancestors of the Etruscans). An ancient Egyptian name for a tribe that occupied a part of Libya. They were closely linked with another Libyan tribe - the Tjemhu. The Tjehnyu joined forces with other Libyan tribes - the Meshwesh and the Libu in attacking Egypt during the reign of Ramesses II, the Tjehnyu were also to join the Sea-People in attacking Egypt. A tribe from Libya that attacked Egypt so that they could settle in the Delta. In temple scenes which depict the battle between the Egyptians, the Sea-Peoples and Libyans - the Tjemhu are shown wearing a headdress of upright feathers with a large curl of hair hanging down one side of their face.